Click on the appropriate area of the map above to view US Census data for an individual city or village. 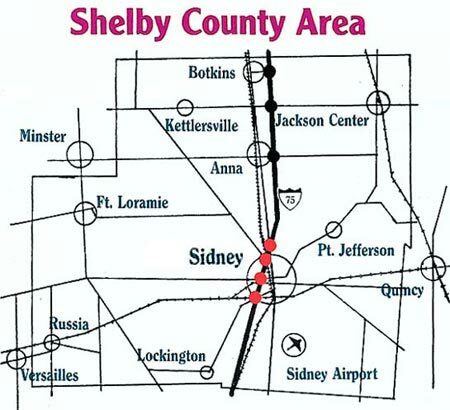 Businesses interested in locating or expanding in Shelby County are urged to contact the ﻿Sidney-Shelby Economic Partnership. The Sidney-Shelby Economic Partnership assists new businesses with locating industrial sites and helps them resolve some of the problems associated with relocation. The Partnership is a non-profit organization composed of business and community leaders dedicated to the economic growth of Shelby County.